Lois Browne-Evans was often vilified in life by political opponents and those within her own party. All that was forgotten yesterday with news of her unexpected death on Tuesday, three days before her 80th birthday. Premier Dr. Ewart Brown, whose ascension to the PLP leadership, Dame Lois Browne-Evans helped prevent in 2003 and was still believed to be opposed to, called a press conference hours after her death. Government flags were also flying at half-mast and later in the day, he announced an even bigger tribute - the day of her funeral will be a public holiday. Flanked by members of his Cabinet, Dr. Brown said: "We mourn because we know in this one sudden event, we have lost so much. Dame Lois was our country's first female barrister, our country's first female Attorney General, and the first female Opposition Leader in the British Commonwealth." He also spoke of how she shattered glass ceilings, battled racism, and empowered women and uplifted black men. He added: "In the meantime we must say farewell to a legend like none other." Finance Minister and Deputy Premier Paula Cox said: "We have lost someone we love - Dame Lois Browne-Evans, a woman of historical significance and modern-day relevance. She died early this morning at 12.55 am after what is believed to be a stroke." Ms Cox described Dame Lois as a woman of warmth, "a role model par excellence" and "a trailblazer." "She had the soul of Bermuda at her fingertips," she said. PLP MP Michael Scott, who owned a law practice with Dame Lois, said her death seemed "so surreal." He also spoke of her humorous side and of how she was a great inspiration. "She was a lady of this nation," he said. Former PLP senator Walter Roban said Dame Lois was his "political mother." He said he first met her in 1988 at the Democratic Party National Convention in Atlanta and he was so inspired, he joined the PLP the following year. She was a warm, genuine person, who had charisma. "I consider her to be a political genius," Mr. Roban said. He said she had a tough road as a PLP leader, trying to keep a party together during its long years in opposition, and as it evolved from an embryonic grassroots organization to becoming a serious contender to lead the government. 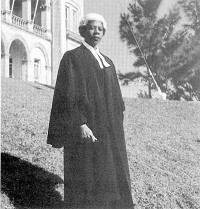 At one point, in 1965, she was the only PLP representative in Parliament. "She kept the candle burning for the PLP," he said. He said it was no secret that she was on the receiving end of criticism from PLP supporters and her political opponents, but the support she received from her family was of great assistance. People whose views of her were formed by what they had read in the headlines were surprised to discover how charming she was when they met her in person. Mr. Roban also spoke of her key involvement in the 1966 constitutional conference which laid the foundation for Bermuda becoming a democracy. From the other end of the political spectrum, Opposition Leader Michael Dunkley joined in the flood of tributes. He said: "Always approachable, always friendly and never afraid of controversy, Dame Lois was one of the major personalities of her time. "From the moment she entered politics as a member of the class of 1963, she was part of the headlines of our lives as Bermudians. "We will miss her. One of the things I admired about Dame Lois was the cross-party camaraderie she exhibited - a reminder that we as politicians can have political differences and heated argument while maintaining cordial relations among ourselves." The Bermuda Bar Association said in a release that Dame Lois was "an outstanding and respected member of the Bermuda bar. "Others will speak to her manifold achievements in the political world. We, as lawyers, can speak to her work in her chosen profession. Her first tremendous achievement was in embarking on a career in law in the first place." It added: "In 1953, it was no mean feat for a young black woman to become a barrister when the profession was the bastion of white men. "She embarked on her chosen career path with courage and fortitude and in doing so paved the way for many women to follow in her footsteps. In every sense of the word, Dame Lois was a trailblazer." Political commentator Walton Brown said: "Lois Browne-Evans was the leading light during a period of rupture and change in Bermuda." In the 1960s and 70s, she represented "powerful symbols of change and social justice." Her powerful oratory enabled her to express the sentiments of ordinary Bermudians. She evoked the aspirations and gave life to the struggles of so many average Bermudians, he also said. "She challenged the old guard and people identified with her fervent desire for social justice. She cast a long shadow. You cannot imagine Bermuda's political development without the contribution of Lois Browne-Evans."